In our continual quest to provide value and the most holistic approach to your health and fitness journey, Windy City recently invested in the InBody 270; a top of the line body composition analyzer with a 98% accuracy rate. Check out the sample report below of what you get with each test. It's quick, easy and precise. There's no dunking, no pinching, no goo on your skin. All you have to do is step up, hold on, and you'll get a full page print-out in 90 seconds. In addition to total body fat and lean mass percentages, the InBody breaks down each segment of your body. This helps you see imbalances; as well, gives an estimate for your total visceral fat by using the body fat percentage in your trunk and legs as an indicator. The reporting on intracellular and extracellular will give you an indicator of inflammation vs muscle building. 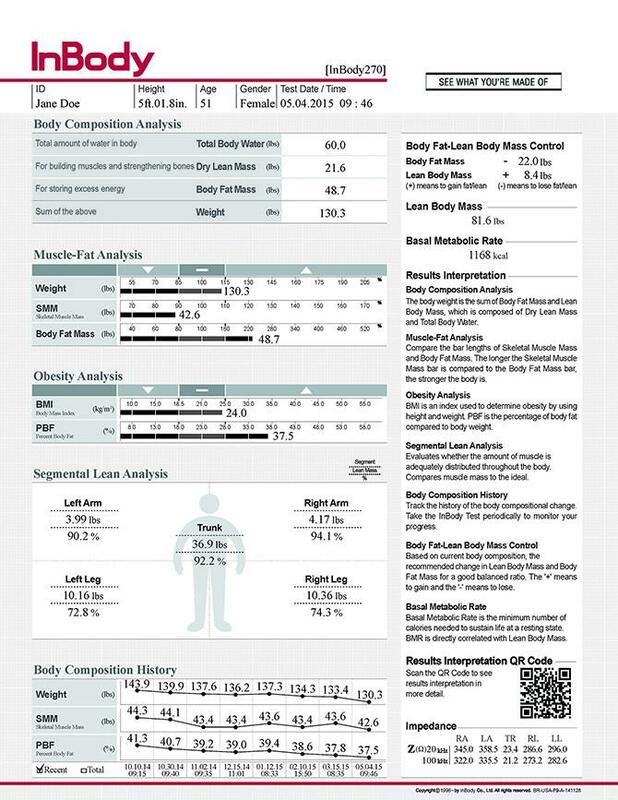 Use body composition analysis to stay motivated and reach your goals. Track your fat decrease and muscle mass increase over time, so you can see yourself becoming healthier and stronger. You can't track these changes with a regular scale. Find out if you're 'Skinny Fat.' Skinny doesn't always equal healthy. 'Skinny Fat' is a term used to describe those people who are thin, yet have more fat and less muscle than recommended. These people have the same health risks as those who are considered obese. Knowing your body composition can help you understand health risks and spur you on to take the actions necessary to prevent sickness and certain diseases. BMI doesn't tell the whole story. Really, it's just a ratio of height and weight that determines if someone is underweight, normal or obese. BMI doesn't factor in muscle or fat mass, however, and can be an inaccurate representation of someone's health. Do not exercise or eat two (2) hours prior to your test. Try to drink as little as possible two (2) hours prior to your test. Empty your bladder just before your test. Wear shorts and a tank top (or loose fitting shirt). Optimal -- though not required -- that women be tested while not having their periods.